After sending Timothy off from Ephesus to deliver the letter of 1 Corinthians, Paul, in his concern for the church, made a quick visit of his own to Corinth. Afterward, Paul returned to his work in Ephesus, where he wrote a sorrowful letter to the Corinthians that has not been preserved (see 2 Corinthians 2:1-11; 7:8). Paul then departed for Macedonia. Once there, he received a good report from Titus regarding the Corinthians (7:13), which led Paul to write a fourth letter to them, titled “2 Corinthians” in the Bible. (See 1 Corinthians [link to 1 Corinthians] page to read about Paul's first two letters to the Corinthians.) The apostle composed this letter near the end of AD 56, possibly in the city of Philippi. However, Paul still felt the need to articulate a defence of his apostleship and his message. Some in the church had apparently taken his meekness among them to be a sign of moral weakness or lack of authority (2 Corinthians 10:1-2). These accusations led Paul to defend himself by arguing that he was on the same level of importance as the other apostles, that he had deep knowledge of the Christian faith, that he had suffered profound physical punishment in the name of Christ, and that he had received visions and revelations from God (11:1-12:13). In what ways do you struggle to forgive others and/or to follow your godly leaders? An overinflated sense of ourselves often leads us to strike out on our own or hold on to our frustration and anger regarding the choices of others. However, just as Paul reminded us of Jesus' ministry of reconciliation (5:17-19), we must seek to reconcile relationships in which disunity reigns. Look out for the pitfall of disunity with leaders and other believers in your own life while striving to live among all people in humility. 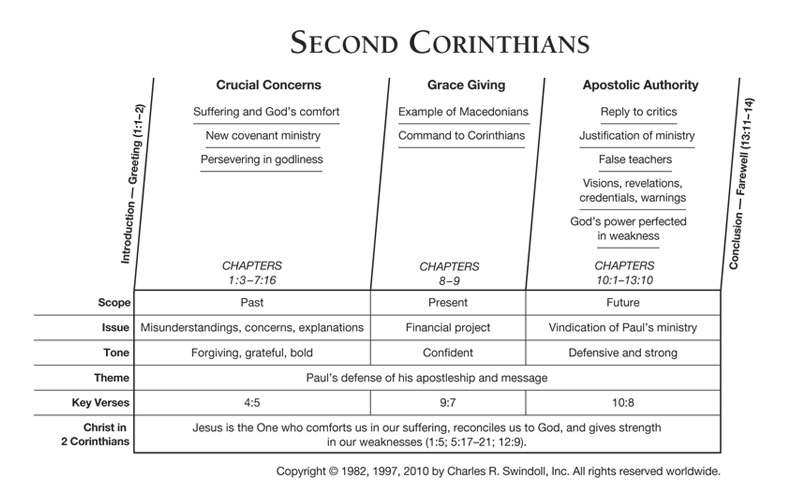 Find resources in the book of Second Corinthians in our resource library.